This dish is far from fancy and probably not what I would make when entertaining. 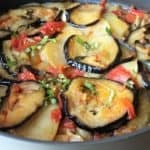 Baked Eggplant and Potatoes with Tomato Sauce is truly a simple, peasant food dish made with a few, fresh ingredients but it has the most incredible flavor. 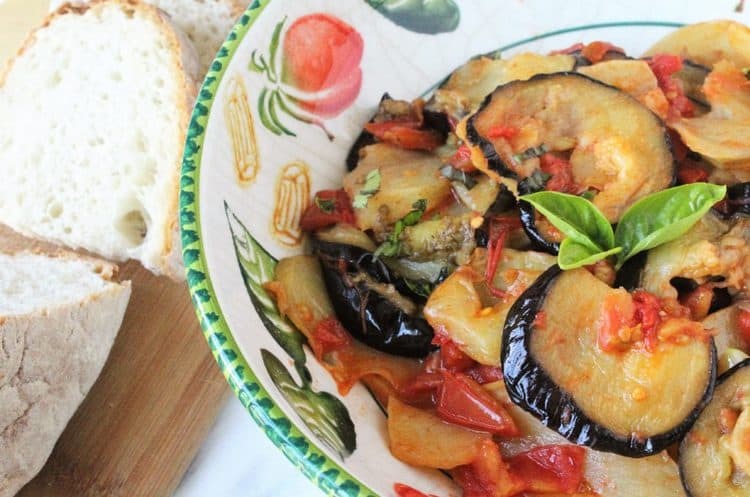 The perfect thing to make at this time of year when your garden is overflowing with ripe tomatoes and local eggplants are available, if you’re not growing them yourself. 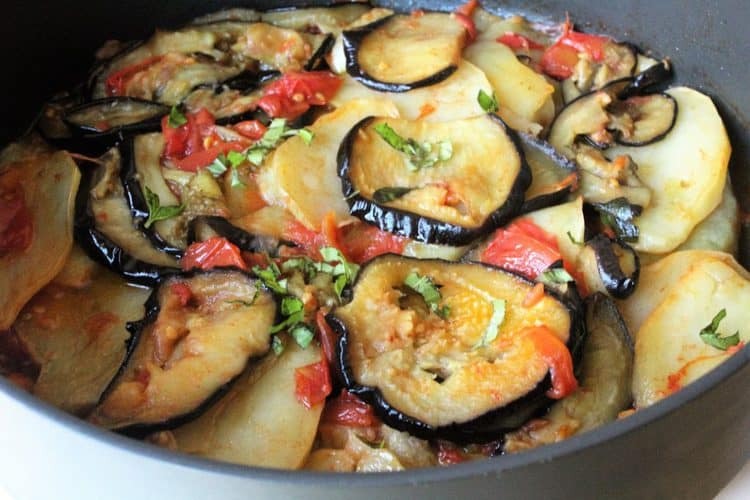 My mother always made this dish during the summer with the vegetables from my father’s garden. I really didn’t find this dish appealing when I was younger. With time I’ve learned to appreciate the simplicity of such dishes (and many other of my mom’s recipes) that lie in the freshness of the few ingredients that it takes to prepare a simple and satisfying meal. That is what Italian cooking is all about. As I mentioned above, it’s not a fancy dish. That said, when adding the potato and eggplant slices to the tomato sauce, they may break apart. 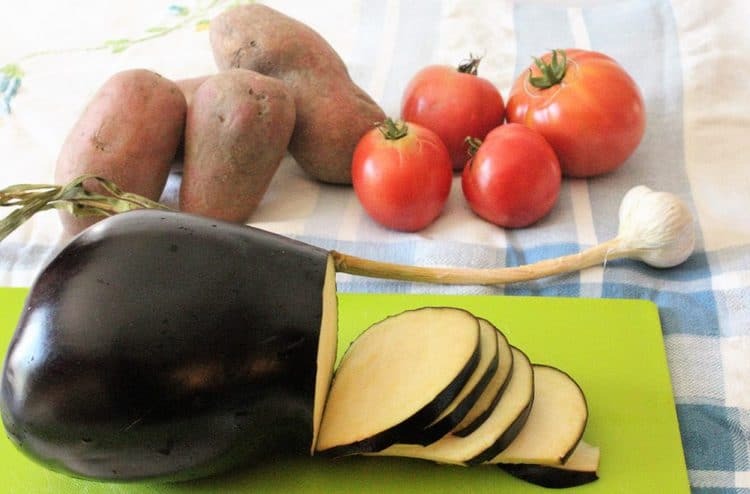 That’s fine because when you’re eating it you want to have chunks of tomatoes, potatoes and eggplant in every bite! It can be served warm or at room temperature. It is almost better if you allow it to sit for a while before serving. All you’ll need is fresh, crusty bread to mop up the oily tomato sauce at the bottom of your plate to enjoy this meal. Or if you prefer, serve it as a side dish with grilled meat. Either way it is a must try! 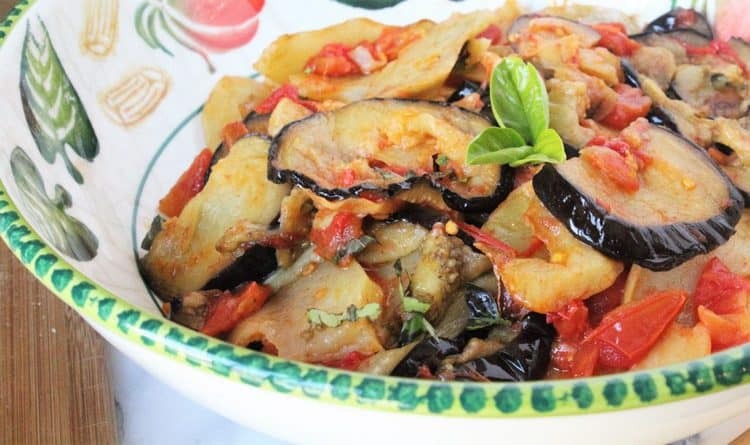 This is a simple dish my mother prepares each summer with fresh garden eggplant and tomatoes. A hearty dish and perfect example of "cucina povera". Preheat oven to 350C. Prepare 2 baking sheets with parchment paper. Peel and cut potatoes into 1/4 inch thick slices. Place on baking sheet, brush both sides with olive oil and salt lightly. Bake for 25 minutes, flipping slices halfway. Set aside. Meanwhile, prepare the eggplant. Slice into 1/4 inch thick rounds. Place on baking sheets covered in paper towels and lightly salt both sides. Let sit for 20 minutes. Rinse and pat dry the eggplant with a paper towel. 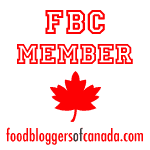 Place the eggplant slices on 2 baking sheets covered in parchment paper. Brush both sides with olive oil and salt lightly. Bake for 25 minutes and flip halfway through. While the eggplant bakes, dice the tomatoes. Place in a large skillet and bring to a boil, then lower to a simmer and cook for 10 minutes. Add the crushed garlic clove and sal,t to taste. Add the baked potato and eggplant slices to the sauce as well as the basil leaves and a drizzle of olive oil, if desired. Stir gently to combine the tomato sauce with the vegetables. Cook on low heat for an additional 5 minutes. Remove the garlic clove and serve warm or at room temperature with fresh bread. I make your recipe when I am entertaining every time. Delicious. Thank you muchly. Hi Lydia, I'm so glad you enjoy this recipe. It's so simple yet so flavorful. Thanks for letting me know!